In the late 1980s and into the early 1990s, when I was quite young and did most of my Nick at Nite watching, it seemed they stretched a bit further back for shows than nostalgia, re-run based stations do now. Maybe being able to pick over selections from the initial Golden Age of television had something to do with it, or maybe memories were longer then. Rather than allow excessive amounts of nostalgia to get mixed into this post I will leave that an open-ended question. There will be some reminiscing involved because my history with this episode is much of why I like it, but by no means all. That is because this particular episode more than any other on any show lodged itself in my (sub)consciousness and was intermittently lost through the years as I’d forget about it then recall it again. Also, I’m grateful for this opportunity to discuss this episode in part because a while ago I introduced the concept of Cinematic Episodes, and except for two entries I’ve not revisited it. So, finally I have returned to discussing television. I even have a partially drafted take on Hitchcock’s turns directing the show he produced and hosted, so it really is something I’ve anticipated. Amazingly Hitch didn’t handle this particular episode, but like almost all the stories they definitely bore his stamp. As Alfred Hitchcock Presents became one of the select TV shows I started collecting seasons of on DVD, I began to search for this episode, amongst others. It was actually only seeing this blogathon announced that I discovered what its name was and in what season it aired (as it turns out its the most-recently distributed in the US, Season six). Due to this fact, I had the unusual pleasure of seeing it for the first time in eons, and one tremendous development was that it still affected me greatly; however, I had entirely forgotten the ending – but I’ll get to that. For now, my impressions on the episode both then and now. The premise of the story is fairly simple. 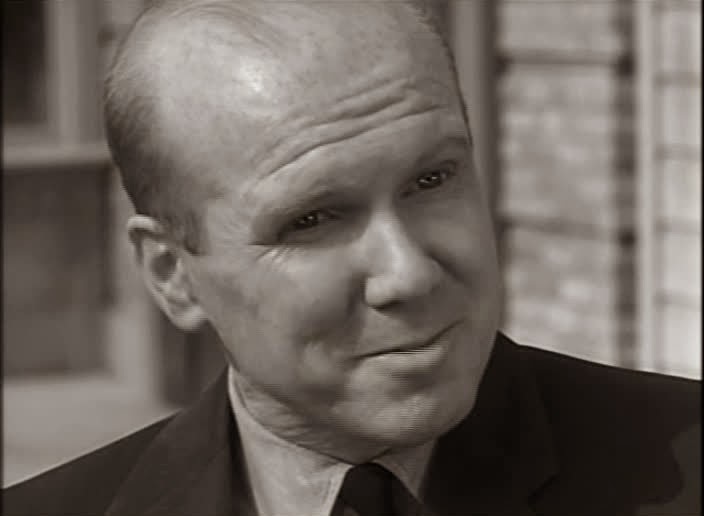 A salesman, Leon Gorwald (John Fiedler), is cited for jaywalking. In a clumsy attempt to bribe the stickler cop (Ron Nicholas) he is hauled off to jail. After a bit a suspected murderer (Richard Jaeckel) is brought in. Eventually there are fears that a lynch mob is forming to raid the jail the police try and make arrangements to transport the prisoners. The suspect has no designs on waiting to be lynched though, he overpowers the sheriff tricking him and getting out of his cell then forces Gorwald to trade clothes with him. What I had recalled most vividly was the beginning. The thought of being stuck in a cell for jaywalking (bribe attempt or no bribe attempt) was terrifying enough in and of itself. However, that part omitting the bribe attempt is what I recalled. All I remembered beside that was the dread suspense, which was still there many years later with a lot of added nuance. It’s very clear to see that this and all the other episodes of this show were basically in three-act structure. What’s impressive here is that the unity of time and space is sustained through a large portion of the story in the jail. There’s only one true temporal ellipse, not including the omission of small fractions of time that don’t need to be seen by more modern audiences. In regards to modern audiences the episode, like all of Alfred Hitchock’s Presents’ episodes, featured stand-ups by Hitch himself teasing the story, adding gravitas or humor where needed, adding finishing touches or throwing it to commercial, while mocking the sponsors. In this particular episode it’s more adding levity due to the nature of the ending of “the play,” as he was wont to call it. 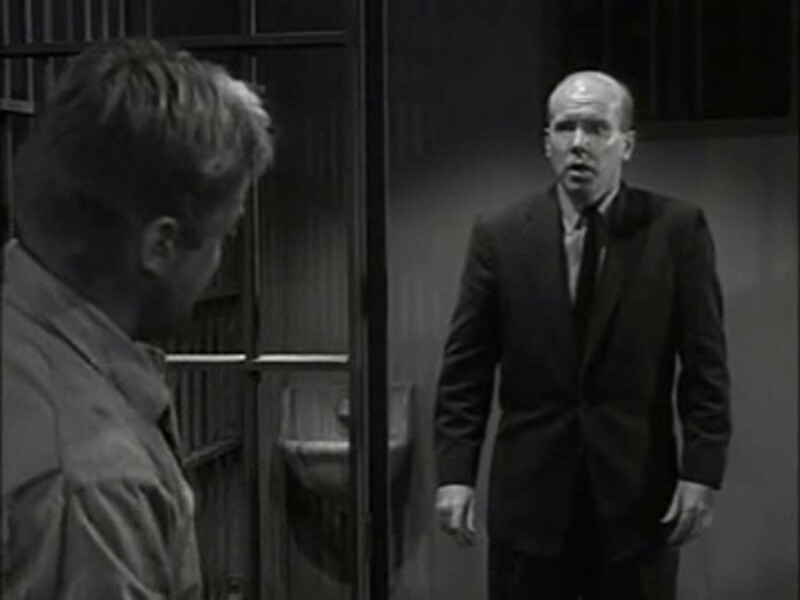 Setting aside the traumatic mark this episode left on me there was room to notice more of what made this episode work for me: John Fiedler is key amongst them. He’s a face you may recognize, a name harder to recall, but you likely know the voice. Fiedler was the voice of Piglet from the time Walt Disney started handling the character until his (Fiedler’s) death. Another aspect that really makes it work is the direction of Norman Lloyd. Lloyd was one of the most prolific director’s during the show’s run, and consistently delivered results. His episodes, for being so numerous, were not always the best but he did helm many great ones. 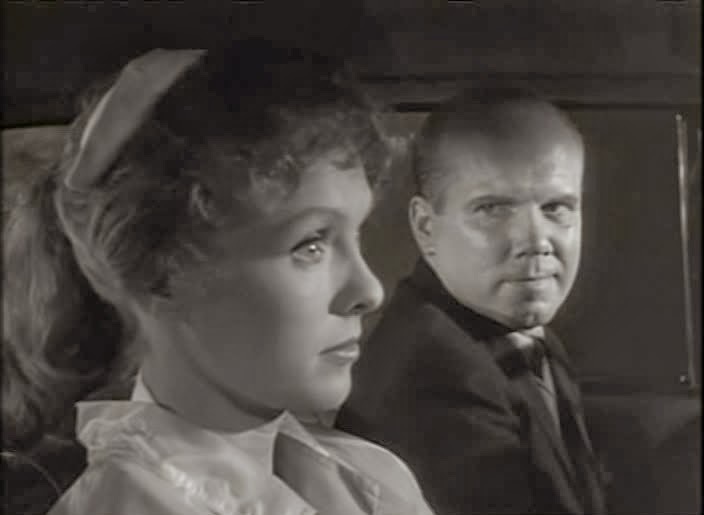 Much like the films Hitch directed the episodes of the show frequently found their inspiration from works of fiction. This particular tale was originally written by Henry Slesar and appeared in Ellery Queen’s Mystery Magazine. It truly is an ideal candidate for a short form treatment because the conflict and set-up are so simple and unencumbered by secondary concerns. Since this was a show of mystery and suspense I will avoid discussing plot detail much further than I already have, lest I ruin the surprise. However, even knowing all the facts anew (as I watched it twice in preparation for the piece, it still worked with nearly equal efficacy the second time around. The reason this is so, is that like many forms of entertainment, this episode plays with your perceptions. Types of characters and actors are shortcuts for those working on a project and for the audience alike. They allow immediate identification and classification before characterization has begun. Without much time to develop character, and more time focused on situation and plot, perceptions are more easily exploited. This episode plays this game expertly. Another nuance that has always struck me is that: dead silence can be very dramatic. No silence is deader than a monophonic track. Even when there is dialogue the ambient sound can be very low. Hitchcock and his show knew how to use silence and volume well. Two of my notes in preparing for this blog dealt with volume. One commented on the whispered conversations the officers had about how to deal with the potential lynchmob, another about the bombastic, loud laughter of the suspect. This unsettled tone of voice throughout, the repetition of dialogue; it all gets to you. 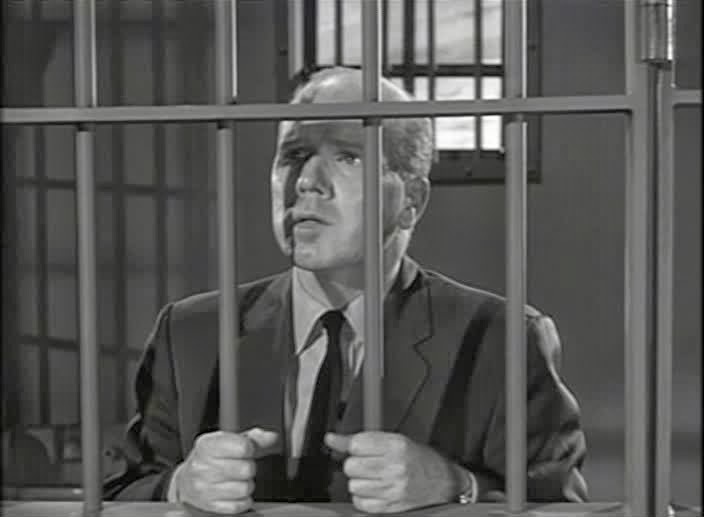 Alfred Hitchcock Presents reached heights in suspense, writing and performance that few shows have reached – especially considering the anthology nature of its structure – and “Incident in a Small Jail” is perhaps the finest example of that.